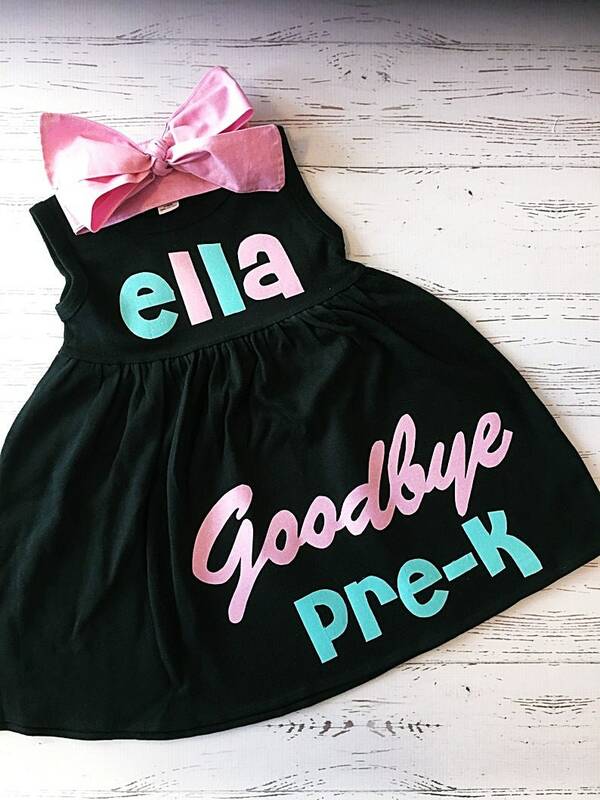 Last day of school dress for little girls. The pink and aqua fabrics are sparkly!! Darling Personalized dress in your choice of dress color and sleeve length (select from drop down boxes). Offered in dress sizes 12M up to size 8. HOW WILL OTHER GRADES LOOK? Top of Shoulder to Sleeves Hem - 11.5"
Top of Shoulder to Dress Hem - 17.5"
Top of Shoulder to Sleeves Hem - 12"
Top of Shoulder to Dress Hem - 19.5"
Top of Shoulder to Sleeves Hem - 13.5"
Top of Shoulder to Dress Hem - 21.5"
Top of Shoulder to Sleeves Hem - 14.5"
Top of Shoulder to Dress Hem - 24"
Top of Shoulder to Sleeves Hem - 16"
Top of Shoulder to Dress Hem - 27"
Top of Shoulder to Sleeves Hem - 17.5"
Top of Shoulder to Dress Hem - 29"
Absolutely pleased. My granddaughter loves this sweet, unusual dress. Great spring dress.